These bags are great for gift giving and can be made in your loved one's favorite colors! 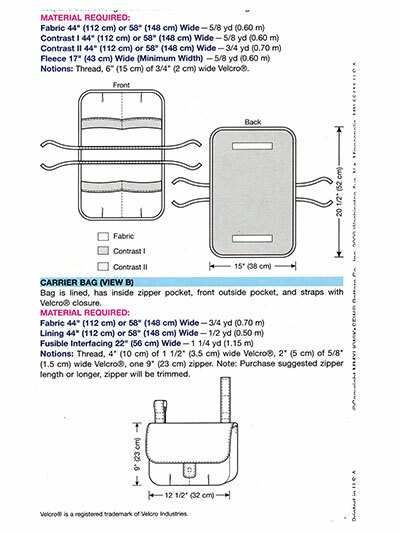 The carryall pattern (shown in image) hangs over rail, has fleece inner lining, pockets, ties and a Velcro® closure. Finished size is 15" x 20 1/2". The carrier bag is lined, has a zipper pocket, front outside pockets and straps with a Velcro® closure. Finished size is 9" x 12 1/2". 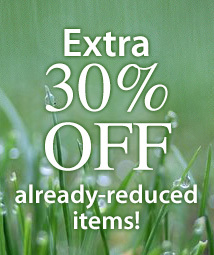 Great easy walker bag!! Easy instructions and pattern. An excellent easy item to make for fund raisers. Love making at my senoir center to sell or donate. Men love them in a Camo print material so they can be costomized for anyone. This pattern is great. My hands need to be free to use the walker. 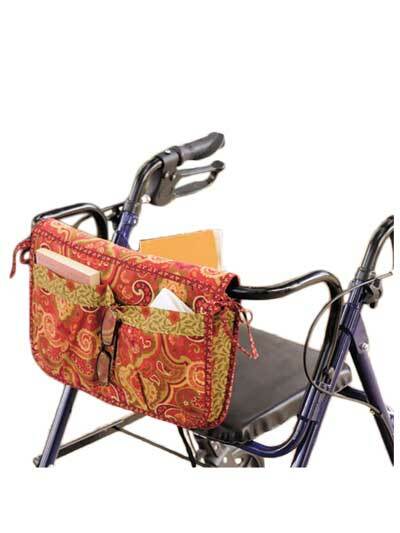 My walker similar to the one pictured also has a slotted metal basket under the seat. I need a pattern for a liner or 'basket' that fits inside the spotted metal basket now to keep small items from falling through the slots & getting lost forever. If you could get one & put it up for sale there are lots of people who need it. I like what is see of this bag on a walker. I have to use a walker, when I plan to walk for a distance. I have been trying to come up with a pattern for a item like this. I have not been successful, up until now. It is easy to make. Thank-you.